Electro-optical and infrared systems are fundamental in the military, medical, commercial, industrial, and private sectors. Systems Engineering and Analysis of Electro-Optical and Infrared Systems integrates solid fundamental systems engineering principles, methods, and techniques with the technical focus of contemporary electro-optical and infrared optics, imaging, and detection methodologies and systems. The book provides a running case study throughout that illustrates concepts and applies topics learned. It explores the benefits of a solid systems engineering-oriented approach focused on electro-optical and infrared systems. This book covers fundamental systems engineering principles as applied to optical systems, demonstrating how modern-day systems engineering methods, tools, and techniques can help you to optimally develop, support, and dispose of complex, optical systems. It introduces contemporary systems development paradigms such as model-based systems engineering, agile development, enterprise architecture methods, systems of systems, family of systems, rapid prototyping, and more. It focuses on the connection between the high-level systems engineering methodologies and detailed optical analytical methods to analyze, and understand optical systems performance capabilities. Organized into three distinct sections, the book covers modern, fundamental, and general systems engineering principles, methods, and techniques needed throughout an optical system’s development lifecycle (SDLC); optical systems building blocks that provide necessary optical systems analysis methods, techniques, and technical fundamentals; and an integrated case study that unites these two areas. It provides enough theory, analytical content, and technical depth that you will be able to analyze optical systems from both a systems and technical perspective. William W. Arrasmith received his Ph.D. in engineering physics from the Air Force Institute of Technology (AFIT) in Dayton, OH in 1995. He earned an M.S. in electrical engineering from the University of New Mexico in Albuquerque, NM in 1991. He obtained a B.S. in electrical engineering from Virginia Tech in Blacksburg, VA in 1983. In his current position, he is a Professor of Engineering Systems at the Florida Institute of Technology (FIT) in Melbourne, FL. Prior to FIT, he served in the United States Air Force for over twenty years, culminating with a rank of Lt. Colonel. During his time in the Air Force, he held several positions including Chief, Advanced Science and Technology Division, Applied Technology Directorate at the Air Force Technical Applications Center; Assistant Professor, Weapons and Systems Engineering Department, United States Naval Academy; Program Manager, Physics and Electronics Directorate, Air Force Office of Scientific Research; Director, Flood Beam Experiment, Air Force Research Laboratory (Kirtland Air Force Base); and Project Engineer, Teal Ruby Systems Program Office, Space Division. Dr. Arrasmith is a member of Phi Kappa Phi, Tau Beta Pi, and the American Society of Engineering Education (ASEE) and has two national patents pending. He received the President’s Award for Service at Florida Tech in 2013 and the Walter Nunn Excellence in Teaching Award in the College of Engineering at Florida Tech in 2010. 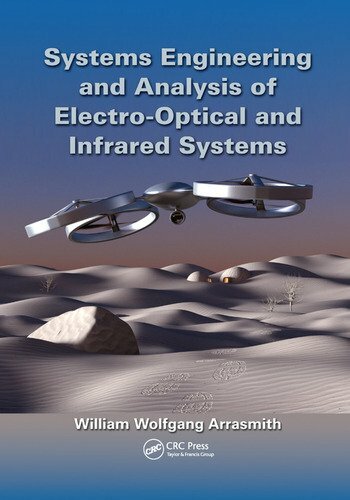 "… Arrasmith weaves together the essential elements of systems engineering with a focus on the technical performance of optical systems to provide a comprehensive study of these disciplines. A systems engineering lifecycle model is used to introduce design steps in the construction of optical systems that reinforces systems thinking. It is a pleasure to see a highly technical engineering field such as optics linked so well with systems engineering principles and the role of an enterprise architecture. Each topic benefits from the presentation of its counterpart as the design lifecycle is applied and illustrated." "… readers can obtain the up-to-day information/technology in the fields of enterprise architecture and optical systems model. … integrates fundamental methods and techniques of enterprise architecture and optical systems model. … a nice text book for graduate students in the fields of electronic engineering, electrical engineering, and physics."